Tryon, NC USA – September 15, 2018 – Belgian’s Bernard Fonck and What A Wave started a sliding development in the Johnson Control Reining of the FEI World Equestrian Games™ Tryon 2018 on Saturday. Scoring 227 at his fourth WEG, Fonck bested two of USA’s team gold medalists, with Daniel L. Huss taking the Silver medal and Cade McCutcheon securing Bronze. Fonck’s medal is the first Individual Gold for a Reining competitor from Europe.”I wanted to show what such a small country can do in the sport,” the 45-year old professional said.Daniel L, Huss premiered at the WEG-level to ride Ms Dreamy to Individual Silver, scoring 226.5. Reining is a “mind game” for the 58-year-old residing in Scottsdale, Arizona. “I visualize the pattern at least 20 times before I go in the arena”, he explained as he described his success over the course of the past week.While the top two medals were decided clearly, it took a nail-biting run-off to decide for third place.Brazil’s Joao Felipe Andrade CS Lacerda and Gunner Dun It Again had put in a score of 225.5 early on in the competition. As the last rider out, 18-year-old Cade McCutcheon rode Custom Made Gun to the tie. 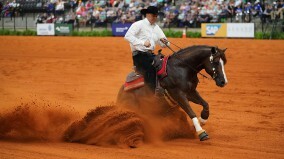 With amazing coolness, the third-generation youngster from the USA’s “first family of reining” kept his nerves to put in a pattern worth 228 points, pipping Lacerda by one point.The McCutcheon family, hailing from Aubrey, Texas, now hold eight WEG-medals after Cade took home Team Gold with the team on Wednesday. Individual Gold tops the collection of three WEG Reining Team Silver medals for Belgium. Fonck had part in all of them, together with his wife, Ann Poels who placed 13th at Tryon 2018. A World Champion in 2016, Fonck used the opportunity to praise familial support.”She is very special. She is left and right from me and in front and behind me, supports me in every way. She is the best,” he said as he credited his wife of 16 years before the medal presentation. Bernard Fonck, Daniel L. Huss, and Cade McCutcheon in their presentation ceremony after the Johnson Controls Reining Individual Final at Tryon 2018. The run-off was a family affair of horse breeding as well since both stallions have the same father, Quarter Horse stallion Colonels Smoking Gun. Altogether five of his offspring qualified for the Individual Final, which hosted nearly 20 entries.For more information on the FEI World Equestrian Games™ Tryon 2018 and to view start lists and results, please visit www.Tryon2018.com.To purchase tickets or for more information about the WEG, please visit www.Tryon2018.com. Photo Credit ©Sportfot. These photos may be used once in relation to this press release with proper credit.